With nearly 200 part and full-time resident species, you'll see a lot of birds without even looking. Many species are remarkably tame, and trails are well defined, with explanatory signs to help identification. The greatest number of different birds can be seen from late October to April - on a good day, you might count 50 - 60 species. 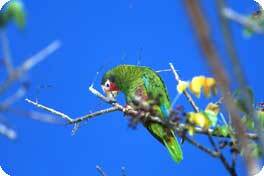 In summer, when non-breeding migrants have moved on, residents including the near-threatened Cayman Brac parrot rule the roost. The Sister Islands are a long way across water from anywhere- that's why so many birds stop off on their seasonal migration to the West Indies, Central and South America and warmer weather. Over 70 species of non-breeding wetland migrants have been observed- egrets, ducks, plovers and sandpipers commonly, flamingos and spoonbills occasionally. Those who give their offspring Cayman birthrights include the pied-billed grebe, West Indian whistling-duck, tricolored and green herons, yellow-crowned night-heron, willet, and black-necked stilt. Summer breeding visitors are least tern and white-tailed tropicbird, gray kingbird, black-whiskered vireo and Antillean nighthawk. Island landbirds include Caribbean elaenia, loggerhead kingbird, bananaquit, thick-billed vireo, vitelline warbler, zenaida dove and red-legged thrush. The Sister Islands have five seabird colonies, red-footed booby, brown booby, magnificent frigatebird, white-tailed tropicbird and least tern. Migrant land birds (115 species) are mainly North American species although some South and Central American migrants occur occasionally. Around sixty species are regular in winter and on passage, most commonly raptors, swallows, warblers, and buntings.